The fifth Cholmondeley Pageant of Power takes place from 15th to 17th June in the glorious grounds of Cholmondeley Castle. Taking to the 1.2mile circuit will be over 150 historic and modern racing cars and motorbikes. The Pageant showcases high-octane action on land, water and in the air, with powerboat action on the Mere, military combat power demonstrations and aerobatic displays including the fantastic Breitling Wingwalkers. 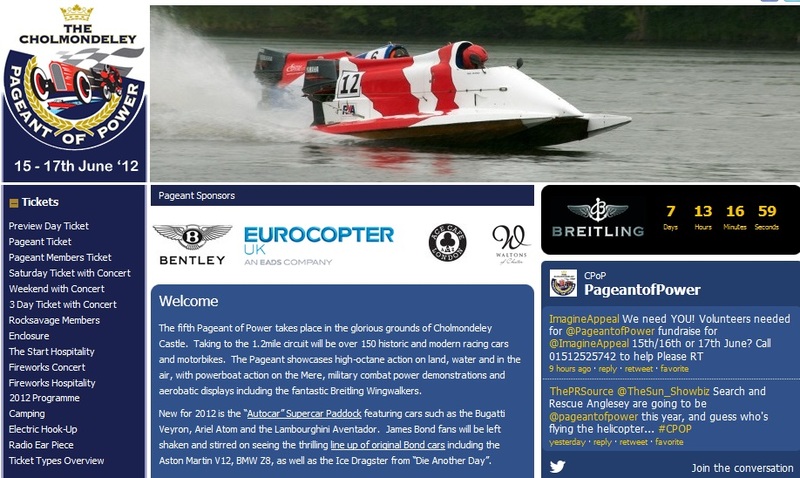 The 2012 Cholmondeley Pageant of Power runs from Friday June 15 to Sunday June 17. Set on the grounds of Cholmondeley Hall in Cheshire, the ‘Goodwood of the north’ will feature a mixture of cars, bikes and even powerboats on the site’s lake. The cars that will power up Cholmondeley drive include a host of F1 cars, including BRMs, a Frazer Nash and a 1990 F1 Lotus. Also featured is the Bentley Speed 8 that won the 2003 Le Mans 24 hours and a collection of Group B rally cars. There’ll even be a powerful Ford Transit van powering along the specially created rally stage. Race2Recovery – a team of amputee soldiers – will be attending to raise money in order to take part in the 2013 Dakar Rally. The money will go to Tedworth House, a Help for Heroes assessment and recovery centre. Another exhibition will be ‘Bond in Motion’ which, in partnership with Beaulieu’s National Motor Museum, will be celebrating 50 years of 007 and his motors. The selection of cars being shown at Cholmondeley include the ‘vanishing’ Aston Martin V12 Vanquish and the Jaguar XK8 that fought against each other in Die Another Day plus the BMW Z8 that was infamously sawn in half in ‘The World is Not Enough’, but in one piece. Apart from motorised horsepower, original horsepower is available with an equestrian display team. Other attractions include a fireworks concert on Saturday and rides for visitors in boats, hovercrafts, tanks and even helicopters.